It's been a while since we posted an update on how "world-renowned commodity guru" Dennis Gartman sees the markets ever since his "watershed" - and correct - so far bullish call that "stocks are headed higher" following Jay Powell's capitulation, made one month ago. And as one would expect, considering that the Fed has only gotten more dovish since then, there has been no change in Gartman's stance, and if anything, the authord of the Gartman letter has only gotten more bullish. Follows the excerpt from his latest Gartman letter. We remain positive of equities because of what we have said time and time again each morning for the past several weeks and which needs to be re-said here this morning yet again for nothing has changed: the Fed has indeed “changed” its monetary policies and this change was made clear by Mr. Powell’s comments of now more than a month ago and made clearer midweek last week following the FOMC meeting. The comments made by Mr. Powell in the post-meeting press conference made it clear that the Fed’s balance sheet will continue to be run-off through the process of its debt securities maturing but that this process may be more “patiently” pursued than had been previously understood. In fact, this “subtraction by maturation” process, as we refer to it, may actually be reversed if economic realities demand that it be so; that is, if the economy did in fact turn for the worse rather than the better then the Fed would begin QE again. Thus, rather than pursuing the steady, targeted course of action requiring that $50 billion be allowed to mature-off each and every month, the Fed shall be more “patient” in so doing. have a lesser effect for a while. Nonetheless, those actions, coupled with the Fed’s change in policy noted above, have had a clear positive effect upon global markets. We are therefore long of equities in generic US terms, but we fear we’ve failed badly in not having added to the initial position for we had considered that we’d done enough simply to have turned away from a bearish perspective at the very proper time and then to have turned bullish of equities properly shortly thereafter. We shall have no choice but to become more bullish and when we do we shall add to our position by buying Chinese shares in ETF form. We’ll wait, however, until the Chinese New Year celebrations are nearly over before taking real action. All of that said to this point, we still note that our International Index is down a rather material 1,133 “points” or -8.8% from the highs made last January 29th. However, those numbers are rather obviously growing smaller by the day. Too, for the year-to-date our Index is +845 “points” or +7.8%. More importantly, it is now a very material 1,134 “points” above the lows made on December 26th of last year or 10.7% from there. That, as we’ve said repeatedly of late, is indeed impressive for we have held to the investment thesis that market moves of 7% divide what are mere, common corrections… both higher and/or lower… from real, material trend changes. Further, we have held and we have promoted the thesis that until markets have gone past that 7% threshold with some real “sense of authority” we could not say that the trend has changed. So, for a while we were obviously concerned that stocks had risen clearly through that 7% “Maginot line” but had done so on less-than-stellar volume. Further, given the comments attendant to the chart at the upper left of p.1 this morning we are concerned that volumes have once again waned a bit. 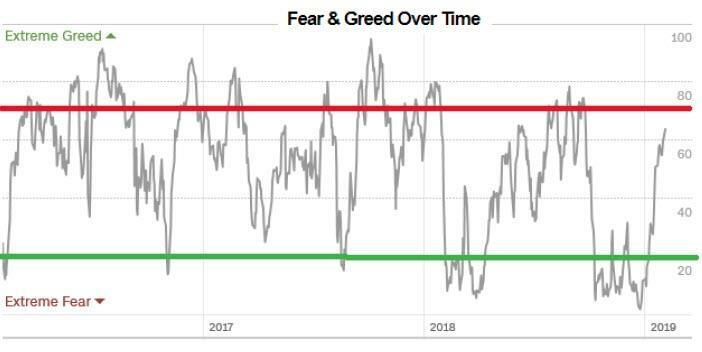 At this point, we note that the CNN Fear & Greed Index…which until four weeks ago had been at uncommonly low, single-digit levels for so much of the previous two months… has made its way to and slightly through 60 and is approaching over-bought territory, having closed yesterday at 64. However, it is not in true overbought territory yet. That requires that this index makes its way to at least 70 and preferably makes its way above 75 and then turns lower. The history of this index strongly suggests that when it has been to single digits… and especially when it’s been there for some protracted period of time as it was for most of the last two months of last year, culminating on very late December when for a few brief moments of sheer, unmitigated panic it actually fell to 2!!! …a rally of some material nature follows. The CNN Index is continuing to prove its worth and so until it rises above 70…and then turns down….we’ve really no choice but to remain bullish. History continue to tell us that that is the proper course of action and as we said here yesterday and as we said last Friday, we are not of the mind to argue with History for once again History is a harsh mistress. And there you have it: Gartman will remain bullish until everyone else is just as bullish.